Watch them grow then let them go! 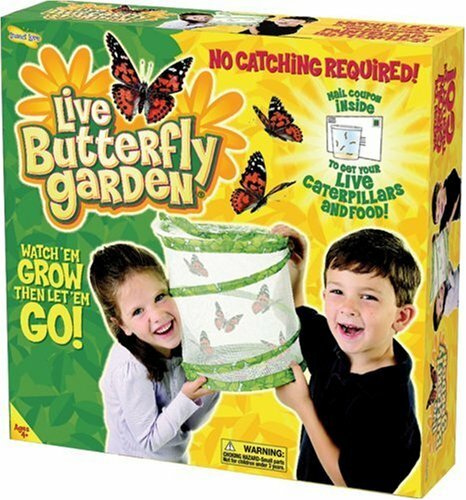 See one of Nature's greatest miracles right before your eyes with our Oppenheim Best Toy Award-winning butterfly raising kit. Coupon provided to order live caterpillars and caterpillar food. Raise up to 10 butterflies while learning all about metamorphosis. See the caterpillars' transition as they mature, change into chrysalides, and finally emerge as butterflies! The butterflies' development takes approximately three weeks, and they're absolutely safe to release into the environment. - Specially coded Certificate to redeem for 2 Cups of Caterpillars. NOTE: Insect Lore WILL NOT SHIP Caterpillars to anywhere that is not part of the continental United States of America. That means they will not ship bugs to Alaska, Hawaii, Puerto Rico, Guam, Mexio, or Canada.